I had the pleasure of taking the day off of work and playing this course yesterday. It was a casual outing with the SCGA. Unlike the official tournament I played in last weekend at Lakewood, it was a more relaxed get-together. 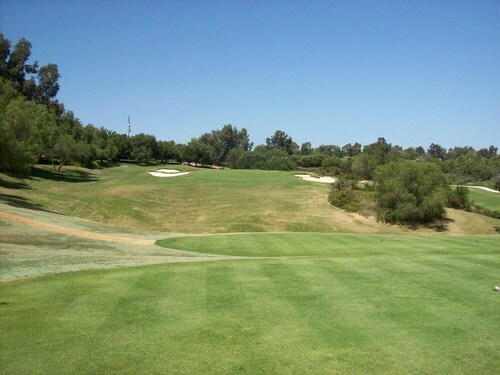 Throughout the year, they set up these outings on private courses and high-end tracks throughout Southern California. They usually get pretty good rates and it’s always nice when someone else makes all the arrangements. All we have to do is show up and play a great course! Most of these outings are on weekdays, so I don’t have as many opportunities to participate. 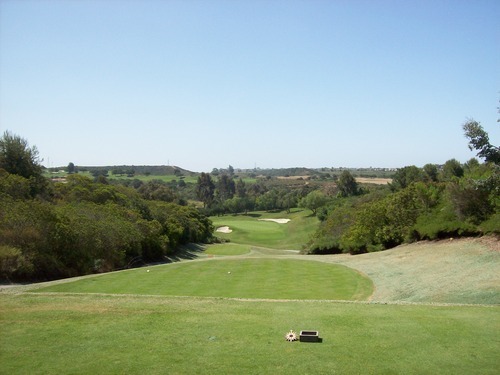 If I could, I would take advantage of many of these events in order to check out some exclusive private courses in the area that I’ve always wanted to play. As it is, I have to pick and choose a select few throughout the year. 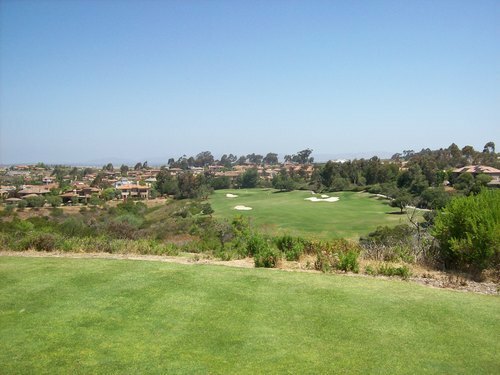 Since The Grand Golf Club is technically a “semi-private” course as part of The Grand Del Mar resort, it was on my “to do” list already in terms of my goal to play all the public regulation 18s in SoCal. 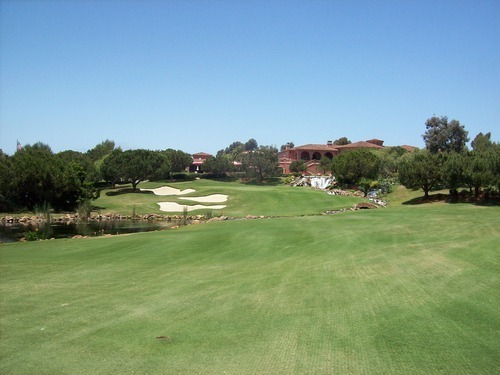 Still, it’s a pretty posh place with expensive rates and generally requires a stay at the resort to play the course. So an outing like this was the perfect excuse to play it at a relatively reasonable rate of $155. I stress “relatively” because it’s still quite expensive and more than I generally prefer to pay for a local round, but it’s a decent deal compared to what they’d normally charge here. 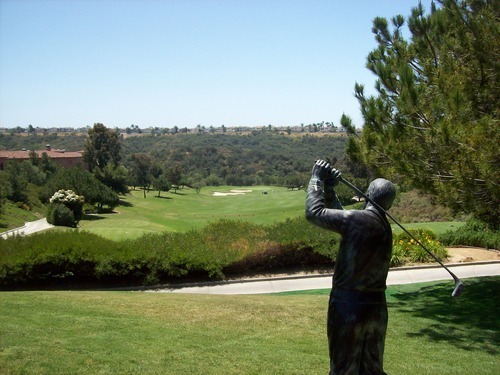 From the moment you show up at the course, you can tell it’s a high-end place that caters to wealthier clientele who are used to being taken care of. The staff here is very friendly and overly helpful (almost uncomfortably so for a regular bloke like me). They really try to treat you well. The clubhouse and facilities are beautiful, as well, and the golf carts were very plush. 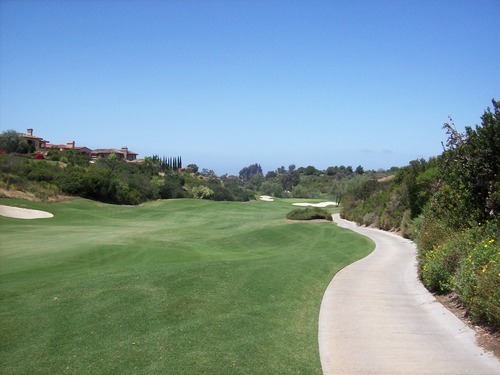 As is the case with many luxury resort courses, they put a forecaddie with your group to provide a more “personal” touch rather than just a GPS system in the cart. Personally, I’m never quite as comfortable playing with a caddie, but our guy, Joe, was full of energy and information. Once we got into the flow of the round, he figured out our personalities and adjusted based on what each of us needed/wanted from him as a caddie. In that respect, he did a great job and I found myself more and more comfortable with his guidance as the round went on. We started on hole #10 and the pace went a little slower than hoped at about 4 hours and 45 minutes. Still, it was a beautiful day (despite some wind which picked up during the round) on a beautiful course, so it was one I didn’t mind enjoying at a more leisurely pace. The Grand was designed by legendary architect, Tom Fazio, who has designed some of the most regarded high-end courses throughout the world. 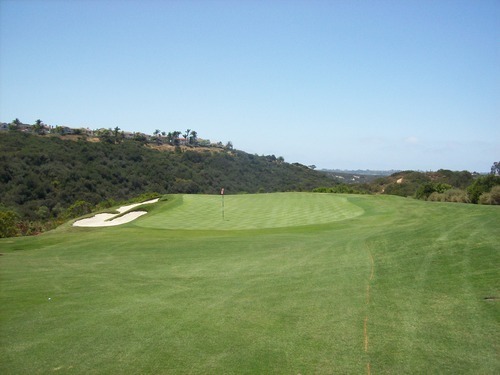 Usually, when his name is attached to a project, they tend to raise the rates significantly—as has been the case at other Fazio tracks I’ve played like Sea Island in Georgia and Pelican Hill here in Orange County, CA. He definitely knows how to use the native landscape and topography to make each course feel like a natural extension of the land itself. The Grand winds through a small canyon in the north part of San Diego near Del Mar. It’s slightly inland, so you don’t get any spectacular ocean views, but you still get the temperate coastal climate. It’s easy to understand why there are so many expensive homes perched high up on the hills surrounding the course. 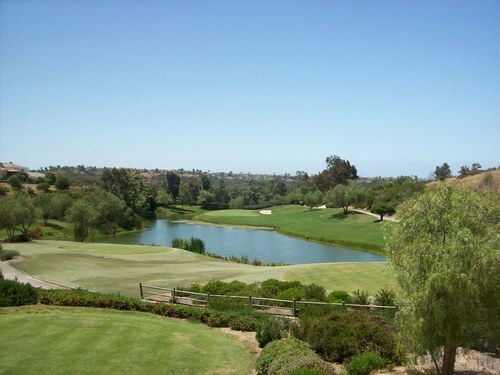 It’s definitely a great setting for a golf course and the resort itself. There are many elevation changes on the course. 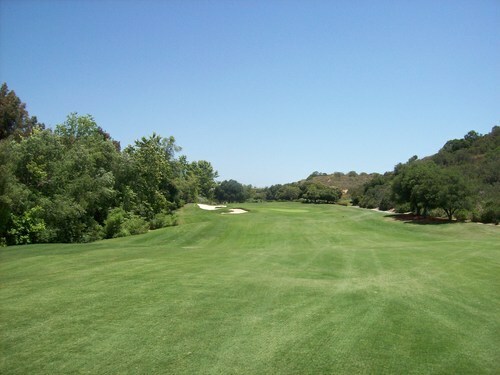 It goes up and down and side to side throughout the canyon, with very few flat lies on the course. There is a great mix of doglegs, though I would say the front nine tends to favor draw hitters while the back nine favors fade hitters. 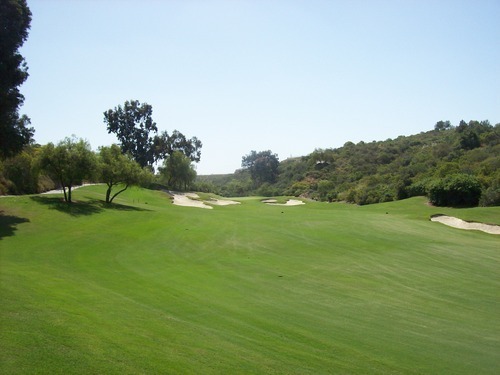 Most of the fairways are pretty wide and forgiving in the landing areas, but there are well-placed bunkers and some hazard areas that cut in that still force you to hit your spots. 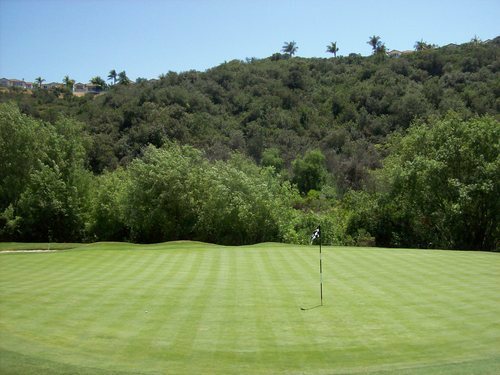 The most challenging aspect of The Grand is the greens. 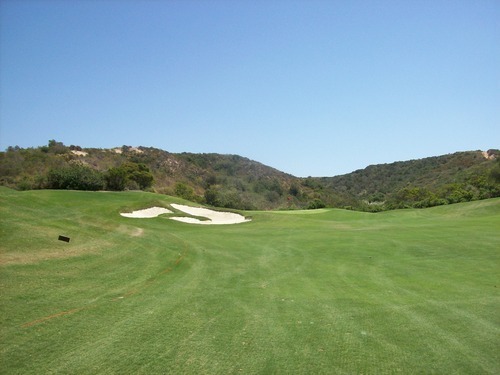 Most of them are slightly elevated (some are severely elevated) and guarded by tough sand traps. 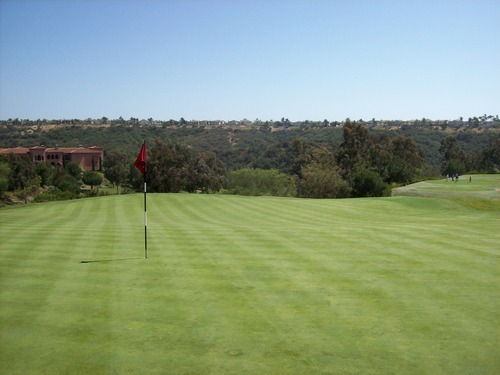 The greens have plenty of natural undulation, though not anything super crazy I thought. The breaks and speeds are very hard to read and our whole group was struggling with putts all day. 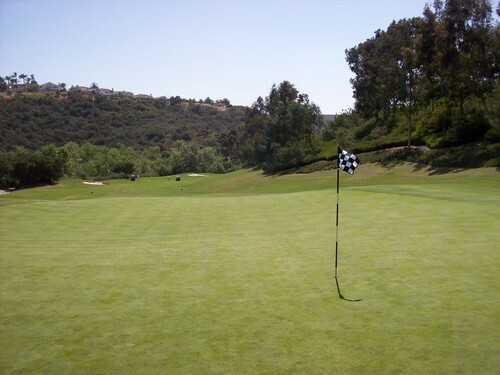 Downhill putts are faster than you expect. 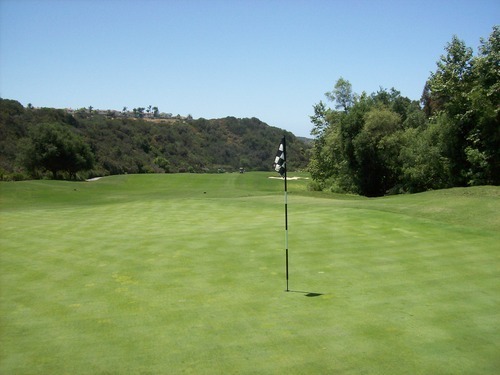 Uphill putts are much, much slower than you think. And all side-hill breaks tend to break a lot more than you anticipate. Of course, when you decide to give in and play extra break, it won’t turn at all! Even with the help of our caddie, these greens definitely messed with our minds and kept us frustrated all day long. There isn’t much water on the course. 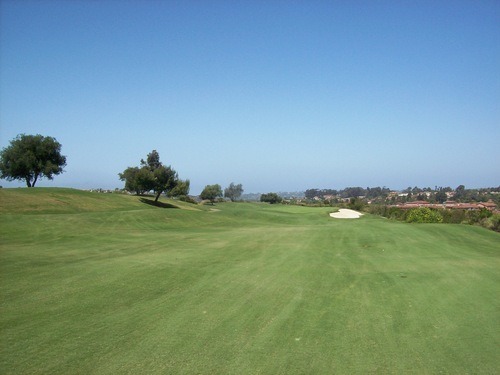 It’s really only on the finishing 17th and 18th holes, which are both very neat. The 18th is one heck of a finisher that’s very tough with an uncomfortable uphill tee shot and beautiful with a large waterfall right of the green and the massive clubhouse framing the green in the background. 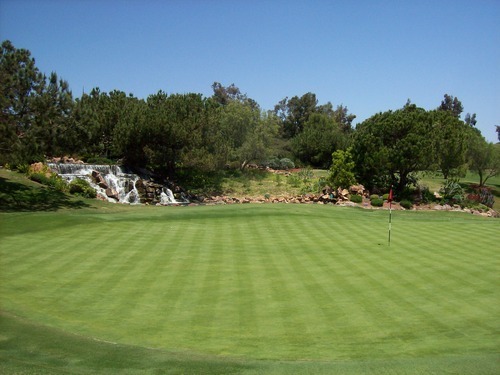 As for the layout, I have nothing but great things to say about The Grand Golf Club. I thought it was fantastic. As for the conditions, some things were left to be desired. 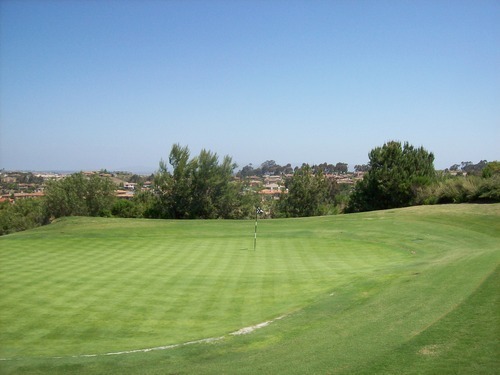 It wasn’t in bad shape, but just not as “immaculate” as one would hope from such a high-end course in the middle of springtime in San Diego. They are doing some maintenance here, though, which should pay off in the long run. The fairways were mostly green, but relatively dry and a little inconsistent with some being quite thin and others being a bit fluffier. The rough was cut down pretty tight, so it wasn’t too penal. The bunkers were great. The tee boxes were level, but they were doing some aesthetic work around all the tee areas. They are working to put in fescue in place of the bermuda that was there before and apparently not “taking” as well as they wanted. If the fescue grows in, it will look really nice. As it is now, these areas are all being sprayed with green seed mixture and look pretty ugly. I would love to go back and see what it looks like once that new grass matures. The greens are healing well from recent aeration and not very bumpy at all. They were fairly slow on putts, though. There was a lot of damage along the collars of many greens. I noticed a number of completely burnt-out spots that were much more sand/hardpan than grass. There wasn’t anything that affected play too much, but not as aesthetically pleasing as I was hoping for. 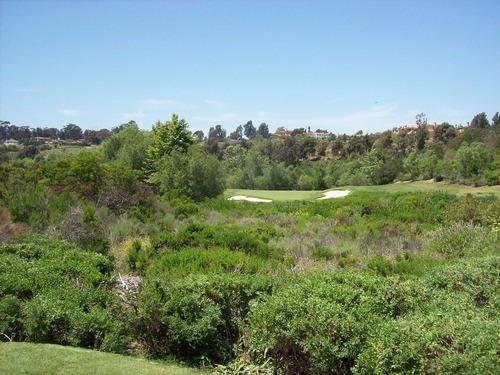 Otherwise, there is a lot of great landscaping around the course with flowers and different types of plants growing in to provide some nice backdrops. Overall, I’d recommend The Grand Golf Club to anyone, especially if price isn’t a deterrent. 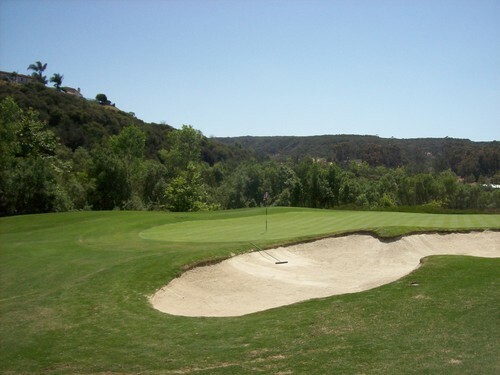 If it is, then seek out a deal for a tournament round or casual outing with the SCGA (perhaps again next year) to book this course at a reasonable rate without having to stay at the resort. 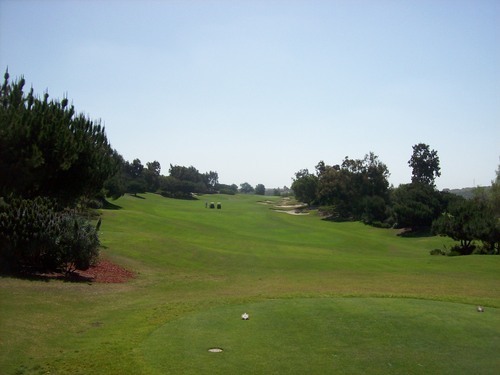 I’m not sure was quite worth what I paid because it’s not a “bucket list” course in my opinion, but it worked out well enough to take another step toward accomplishing my personal SoCal golf course goals.